A bill that would have permanently eliminated an entitlement that prioritized services for high school graduates with developmental disabilities was amended and given first-round approval April 6. LB793, as introduced by Ralston Sen. Merv Riepe, would have permanently eliminated the entitlement, which otherwise would resume in FY2020. 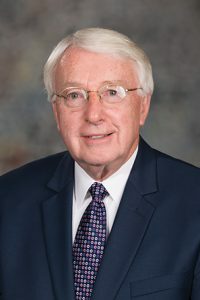 Riepe said he had worked to find alternative language that would be a “win-win for all parties.” The new language, contained in an amendment offered by Gering Sen. John Stinner, was adopted on a vote of 27-6. Under the amendment, if the state Department of Health and Human Services does not have enough funds to provide services to all eligible individuals under the waiver, the department would be required to provide comparable services only to high school graduates. Riepe described to the amendment as “trigger language” for the entitlement. “The way the Legislature will know that this provision is triggered is that every Sept. 15th the department will have to provide a notification to the Appropriations and Health and Human Services committees of whether or not the provision is triggered, so the Legislature may provide appropriate funding for the services,” he said. 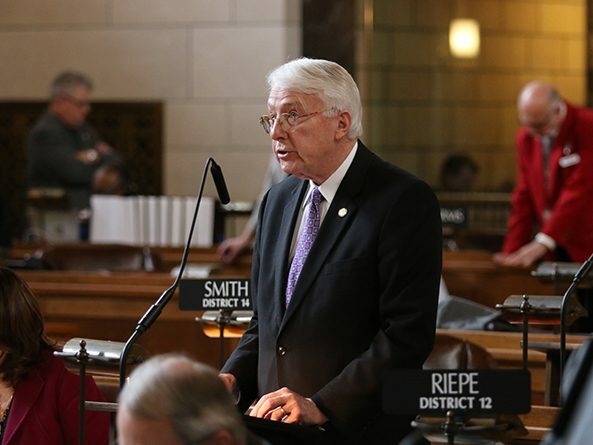 The provision would sunset June 30, 2021, which Riepe said would provide enough time to demonstrate that individuals are being funded through the Medicaid waiver. The amendment also contained provisions of Lincoln Sen. Kate Bolz’s LB1004. The amendment would extend aging and disability resource centers as an ongoing component of Nebraska’s long-term care continuum and require that ADRC sites coordinate and establish partnerships as necessary with organizations specializing in serving aging individuals and persons with disabilities to provide services. Bolz said ADRCs provide information, referral and options counseling to seniors and individuals with disabilities, which helps them stay in their home and community when they choose to do so. “Since December 2016, ADRCs have fielded 9,326 calls and, importantly, ADRCs have created an estimated $4.5 million in cost savings by helping individuals avoid higher cost nursing home placements,” she said. Under the amendment, the state’s area agencies on aging would be required to establish partnerships with one or more lead organizations that specialize in serving people with disabilities to develop an ADRC plan. The department would provide a report to the Legislature each Dec. 1. Funding for the program would come from the Nebraska Health Care Cash fund for fiscal years 2018-19 and 2019-20. Bayard Sen. Steve Erdman opposed the amendment, saying the services that ADRCs provide are “duplicative” and that the measure would violate local control by mandating that local area agencies on aging partner with ADRCs. Riepe acknowledged the concerns and said the Legislature would examine ADRCs over the interim to answer questions about their functioning and effectiveness. Following adoption of the Stinner amendment, senators voted 33-1 to advance the bill to select file.